First off I'm not usually a football blogger, not because I don't know what I'm talking about football (yes, I'm a girl and know what the offside rule is!) but simply because there hasn't been a whole lot to blog about in the last few years. I still can't quite believe that us Bradford City fans are preparing for our second trip to Wembley of this season! And who'd have thought our first trip was a major cup final (none of this JPT rubbish) after seeing off three premiership teams. Excuse the cliche, but this is really what dreams are made of! Especially for football fans of a team who have seen us plummet to the basement league, escape administration twice and witness so many managers who we had so much hope for fail to get us out of this league. 64 games and this is by far the most important. We NEED to be out of this league and had it not been for the cup run I genuinely think we would have walked the league. Had someone asked me at the start of the season of either promotion or runners up in the League Cup Final, I'd have to take the promotion. That would be after asking if they were mad, of course. The money we've earned from the cup run will be so much more beneficial for us in League 1 to make us competitive. Play like we did in the Burton second leg and we can do it, but Northampton will make it very difficult. We can't be complacent, even though they haven't beat us this season they'll give us a good game and will try to ruin our game plan. We need Davies, McArdle, Darby, Meredith to be at their best. I don't rate Akinfenya, but they can be dangerous. Just look at the goal they scored to get them to Wembley. Hopefully we'll have an advantage of already playing at Wembley this season, to get the nerves out of the players. Finally, to those fans whining about how many tickets we've sold - yes 23,000 ish is a little disappointing when we took 34,000 just a couple of months ago but unfortunately an extraordinary, odds defying cup run naturally brings out lots of 'fans' (a refuse to say the p word) who wouldn't venture to Valley Parade on a cold Tuesday night in December. 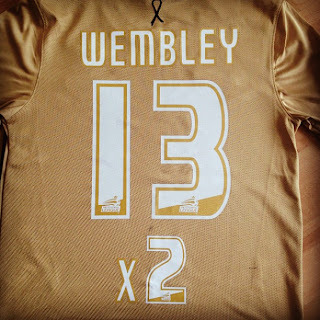 My signed shirt ready for Wembley round 2!